Land's End to John O'Groats in a Straight Line - A beautiful cinematic film following this unique and compelling journey. 'As The Crow Flies' is a breathtakingly beautiful cinematic film following injured soldier Nick Beighton & team. Showing you the United Kingdom as you have never seen it before. This film is a voyage into the human psyche and weaves its narrative through the massive challenges the team faced, both physical and psychological. *****Winner Best Documentary Feature - Los Angeles Independent Film Festival Awards. CA. *****Gold Award - 2015 Documentary &amp;Short International Movie Award. Jakarta, Indonesia. 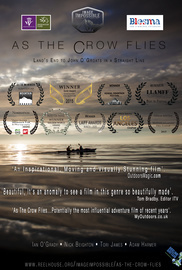 *****Winner 2015 California's Mountain Film Festival, Sir Edmund Hilary Award for Documentary. Discounted price for our last two films. get the full feature of both epic journeys. Both epic, but in very different ways!